Wood is a natural material and appeals to the senses – explore the patterns of each unique log, touch and breathe in the fresh aroma. 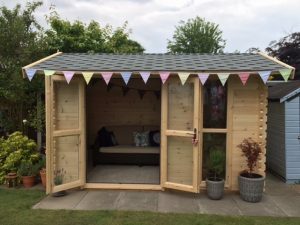 Wood in the living environment promotes relaxation and can help to relieve stress making them great for summerhouses, studios or Mum’s quiet place. A log cabin will move with the seasons and has an ambient temperature. The wood will take in moisture from the air as it ‘breathes’ so they are great for using as a home office or extra storage space. Traditionally built for lakeside fishing cottages in Scandinavia, ski chalets in the Alps and hunting lodges in Canada, log cabins are incredibly practical and versatile. Maybe bear hunting is not your thing but we often sell them for gyms, workshops, kids areas and Man Caves. 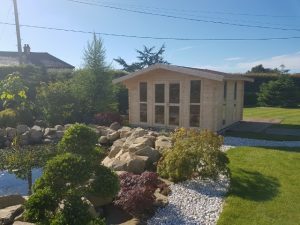 A Log cabin is quick and easy to install and will offer good value for money in comparison to brick whilst being easier on the eye than concrete.